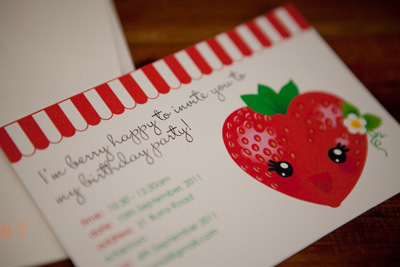 Invitations: Editable printable invitations by the very talented Lisa Tilse (the red thread) for Modern Printables.com. Cake: Made by me. 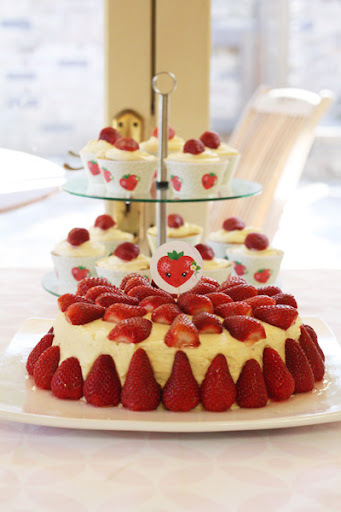 Chocolate Coconut melt and mix cake from Donna Hay Modern Classics Book 2 with vanilla buttercream frosting and topped with strawberries and a round printable strawberry topper. Party Food: Made by me. 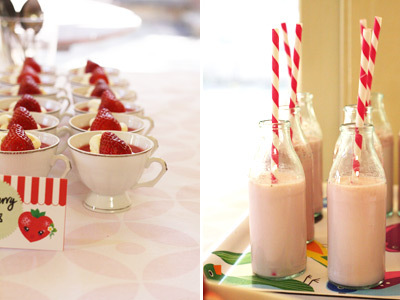 Strawberry smoothies in mini juice bottles with striped paper stores (thanks Lark!). 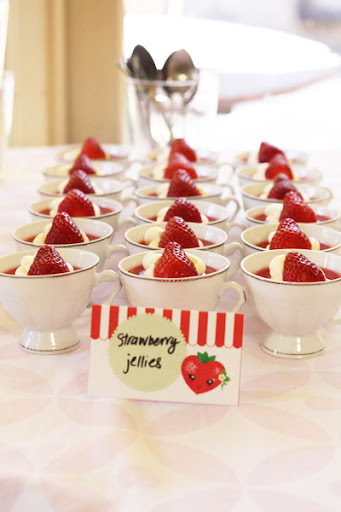 Strawberry parfait (meringue, whipped cream and ricotta, strawberries and strawberry jelly). 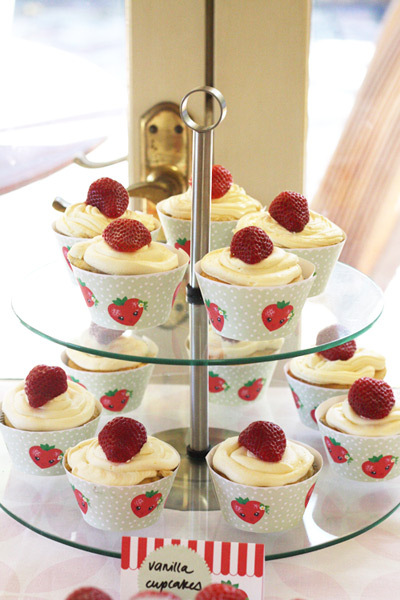 Vanilla cupcakes with vanilla buttercream frosting and a strawberry on top (with printable strawberry cupcake wrappers). 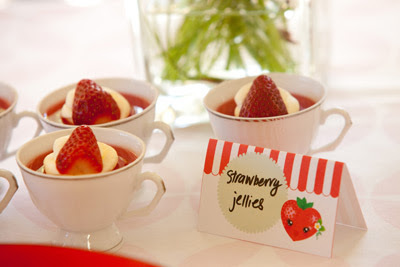 Strawberry jellies with whipped cream and a strawberry on top in mini tea cups (from St Vinnies). 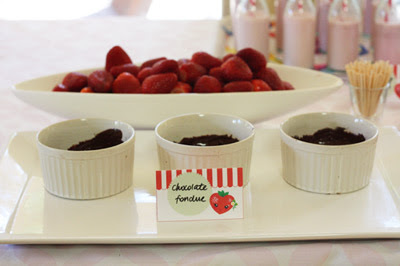 Bowl of strawberries and warm Callebaut chocolate fondue. The adults were served pulled pork sliders with coleslaw (thanks Harris! ), spinach and feta filo slices (thanks Tam! ), and mini quiches (thanks Renay and Sophie!). 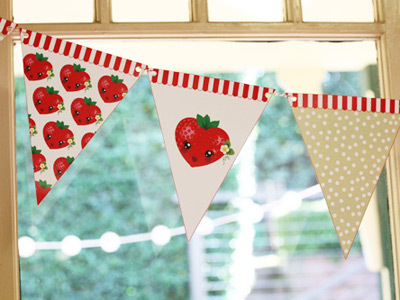 Decorations: Strawberry Party printable pack by Lisa Tilse (the red thread) for Modern Printables.com. 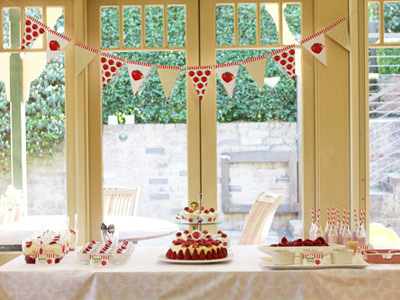 The pack includes invitation, thank you cards, bunting, cupcake wrappers, tented placecards, gift tags and round toppers that I used for both topping the cake and for horizontal and vertical garlands. 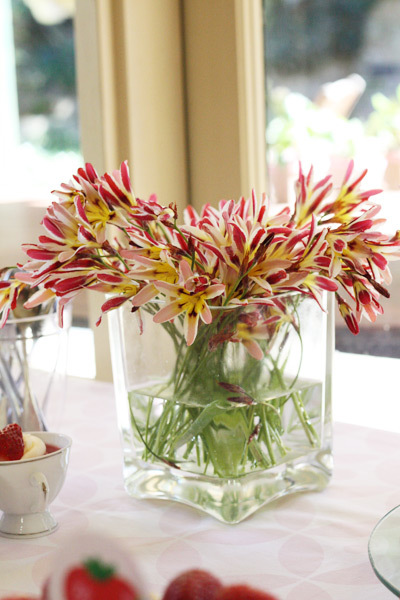 Flowers on the table were fresh wild freesias from a neighbour's garden (thanks Alois!). Tablecloth from Dandi. Bouncing castle on loan from a neighbour (thanks Chantelle!). 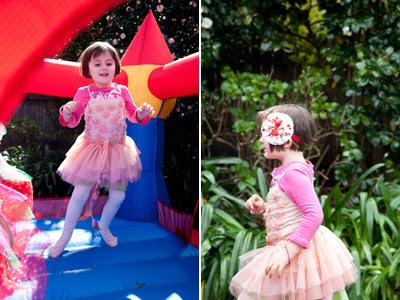 Birthday girl wears: Twinkle Tutu in Eggshell from Tutu Du Monde (layered on top of an old favourite tee of course!) 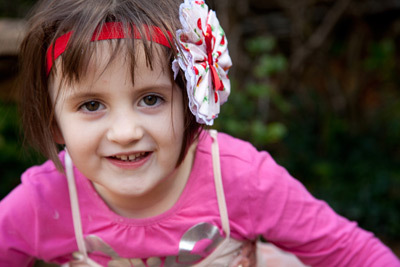 and strawberry headband by Minni Mittsie. 1. When friends offer to bring something, say yes! It was so great to be able to focus on the party food while friends (and amazing husband) made delicious savoury treats for the adults. 2. 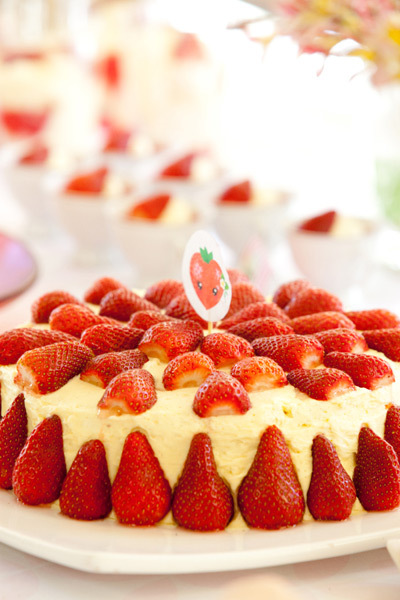 Make the cake early the day before and have twice the ingredients needed on hand. My first cake was a dud and had to be binned, so I was lucky that I started early and could go back to an old favourite recipe. 3. It was also fantastic to have a professional photographer on hand to capture the moments of the day. 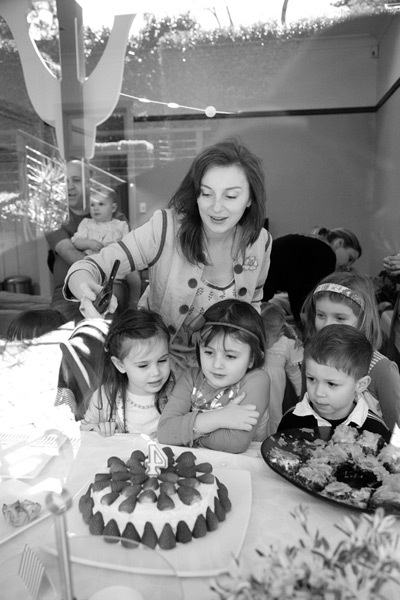 I could only get so many of my own photos while wrangling little ones, lighting candles and managing presents and food. 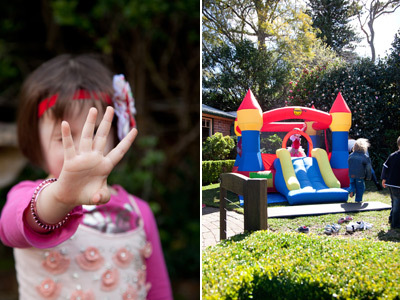 We will treasure our amazing photos from Milk & Honey Photography. Something Special: Rather than provide goodie bags, I gave each family a strawberry plant to take home. 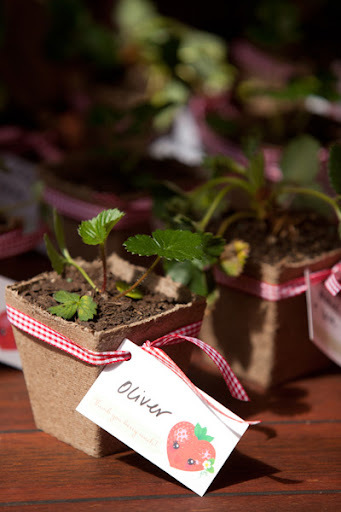 I repotted each one in a decomposing pot, tied with a check ribbon and added a printable strawberry gift tag.They were so much cheaper than a bag of goodies and the parents and kids alike loved them. Photography: Anni from Milk & Honey Photography, and Steph Bond Hutkin from Bondville. 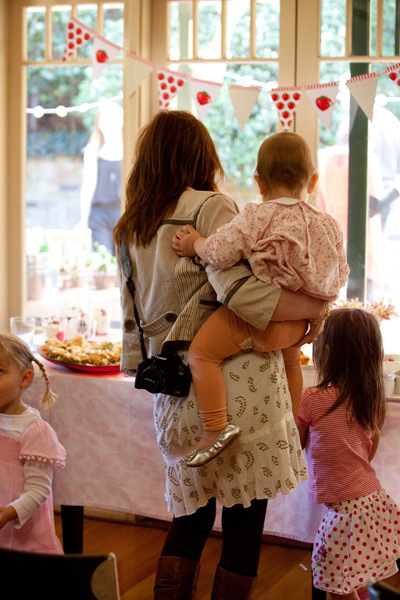 Oh my goodness what a gorgeous party! And the take-home strawberry plant idea is pure genius. Your daughter is a very lucky girl to have such a talented mum. PS. Congratulations on your new enterprise. What a great idea! 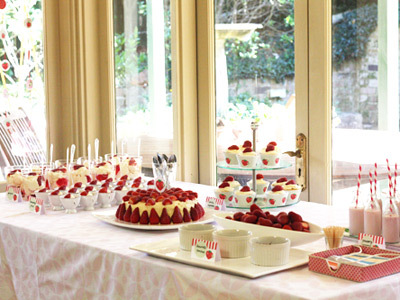 Ah, I want to have a strawberry party for no reason now! Just lovely! That party is amazing Steph! 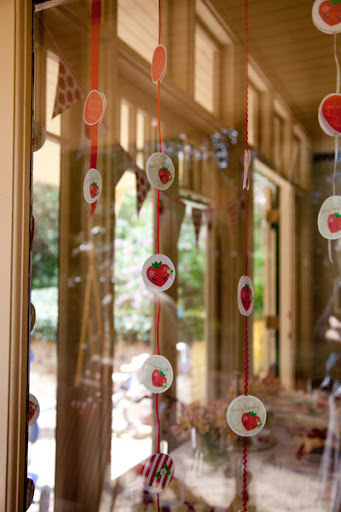 I love that there were no lolly bags - the plants are a great idea. Berry lovely Steph, staged so beautifully. Congrats on the new online store. Good luck! Oh how lovely! Had a look at the Modern Printables website too. It looks so fabulous. What a great party. Happy birthday Big Girl! Wow. What a beautiful party theme. The decor looks great. Thanks for sharing! Yum!! 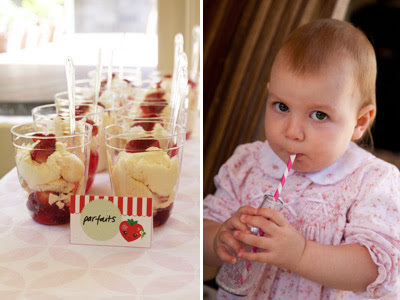 everything looks so yum - especially those strawberry jellies! and Yay for Modern Printables!! Wow! It's beautiful! :) I love it! Hi Steph. Shared this post today over on my blog. I love your simple and sweet strawberry plant favors.